The church’s record of holding power – from Emperor Constantine in the 4th century onwards – has involved some terrible acts of coercion, exploitation, and abuse. Yet Jesus set an example of selfless service, and started a “humility revolution” that fundamentally transformed the West and the way we think about leadership and power. For groups like women and indigenous peoples, what has it looked like when Christians have exercised power for their own benefit? What has it looked like when they’ve exercised it for the good of others? This segment looks at the complicated history of the witch hunts that swept across Europe and America in the early modern period. Misogyny took a deadly turn in the witch hunts that swept early modern Europe and America. SIMON SMART: Welcome to Thale, Germany, where it’s Walpurgisnacht: the old medieval festival for driving away witches. In German folklore, the night of April 30 was when witches met on the Brocken, the highest peak in the Harz Mountains, to hold “revels with the Devil”. Bonfires were lit to try to fence off the witches from the mountain, and any sudden black or dense cloud of smoke was cheered as “a witch flying away”. There goes one now. Today’s festive vibe of Walpurgisnacht is in stark contrast to the very real witch-panics that swept across Europe in the 1600s, devastating whole communities, and leaving thousands dead. Rebecca Lemp was 40 years old, a mother of six, the respectable wife of a high-ranking government official in the German town of Nördlingen. She was deliberately arrested while her husband was out of town on business, and wrote to him from prison. ACTOR (REBECCA LEMP): O you, my most chosen treasure, should I be torn from you so innocent? They force one, that one must confess. How can God suffer it? Why will God not hear me? O my beloved treasure, what is happening to my heart? Alas, alas, my poor orphans. They have martyred me. I am as innocent as God in heaven. SIMON SMART: Rebecca Lemp was burned at the stake on September 9, 1590, in the presence of her family. This period was a strange exception in the history of Christian Europe. Up to 1400, witches weren’t much of a concern to educated Europeans. By 1800, few people even believed they existed anymore. So, what happened in between? What was it that made neighbours, families, sometimes complete strangers turn on each other? And in this way? And at that time in particular? CATHERINE BREKUS: Witchcraft in Europe, like witchcraft in America, was associated with women. It was also a response to political turmoil, to religious turmoil, and so, in that setting, the Bible was used to justify the scapegoating of some people as the source of evil. When people were trying to understand why are these bad things happening, why is God afflicting me, often their answer was because Satan is at work in the world, and there is in fact a witch in our community. SIMON SMART: Take the most famous witch frenzy of all. In February 1692, a panic gripped the coastal town of Salem, Massachusetts. When it finally died down 15 months later, 24 people were dead. What went on here in Salem was different from what some people imagine. Those who were convicted, for instance, weren’t burnt at the stake, they were hanged. And they weren’t all women. Four of them were men. And why they died? Well, it’s actually much more complicated than you might think. At the end of the 17th century the Massachusetts Bay Colony was one of the best educated, most consciously pious communities in the world. They believed fervently in reason and the rule of law. They believed just as strongly in witchcraft. This is the home of Jonathan Corwin, one of the magistrates, who used it to conduct his own special enquiries, or pre-trials. Imagine what would have gone on in here. Decisions being made about people’s lives, with all this fear and expectation swirling around the community. But Salem was not simply a matter of paranoid, superstitious clergymen persecuting helpless villagers. CATHERINE BREKUS: The most important way to think about Salem is that it was a kind of perfect storm of all kinds of historical factors that collided in that particular place. There were factional tensions in Salem Village where people had been fighting for years before the Salem outbreaks. There were also some economic tensions. The late-17th century was the era that witnessed the rise or the beginnings of merchant capitalism, and there were some people in Salem who really welcomed that and others who found that very threatening and scary. All these factors converged and the result was that 20 people were executed. SIMON SMART: One of those people was George Burroughs. He was once the minister of Salem Village – he’d left because of a pay dispute with his parishioners. He was living in Maine in April 1692, when personal enemies from his old congregation accused him of witchcraft. Burroughs was a religious man, just like his accusers, and history records he used the Bible in his defence. It didn’t work. In addition to the nineteen people hanged, several others died in prison awaiting trial. Another, Giles Corey, was crushed to death when rocks were placed on his chest in an effort to make him cooperate with the court. The executions came to an end in October 1692. But the quest to discover what really happened in Salem continues today. 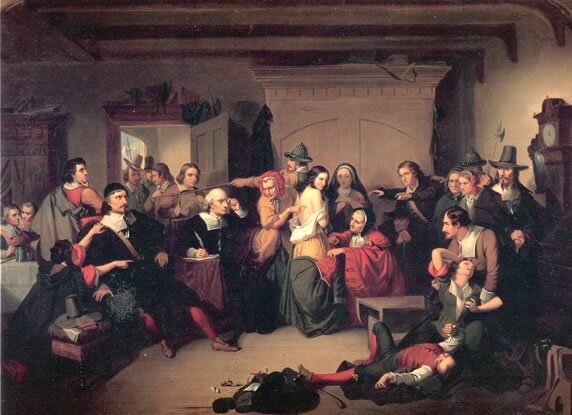 CATHERINE BREKUS: One of the things that we have discovered – 89% of the women accused of being witches in New England stood to inherit independent property of their own. So, these women were threatening understandings of male inheritance and also, I think, men’s economic power. SIMON SMART: Misogyny was certainly a factor at Salem. So was religion. And so was social and economic change, and vicious personal vendettas. The resulting public hysteria is hardly something we’ve grown out of. There’s a reason the phrase “witch hunt” has passed into our language for any unjust, unthinking persecution. Make a list of some examples in history of when power has been used to persecute people. How would you feel if you were falsely accused of a crime? Using words and images, create a collage of things that come to your mind when you hear the term “witch hunt”. Find three examples of witchcraft in popular culture, and for each example choose three adjectives to describe how witchcraft is portrayed. Read this article, “Witch hunting in the digital age”. Based on the information given in the article, discuss in pairs how online witch-hunts compare with the witch-hunts of the 15th-18th centuries. How does the video segment contrast Walpurgisnacht today with the witch panics that swept across Europe in the 1600s? Explain what happened to Rebecca Lemp. Why do you think she might have been accused? Write another paragraph of Rebecca Lemp’s letter. Write down as many things as you can remember from the video segment about what happened in Salem in February 1692. 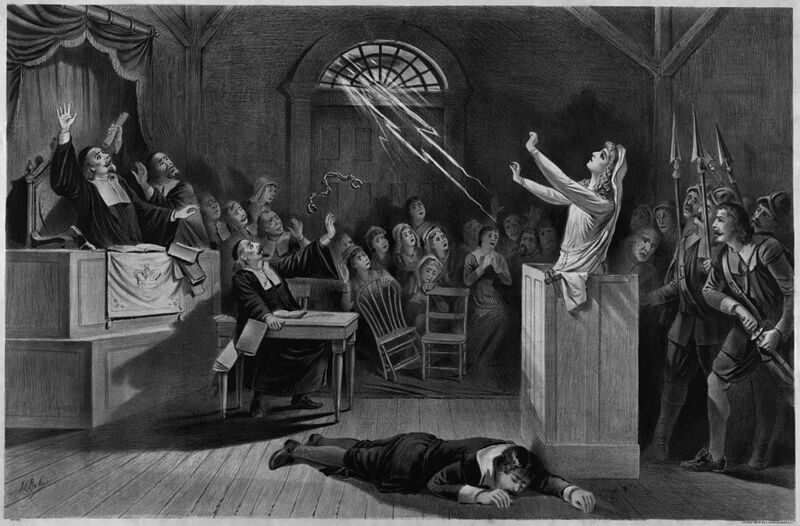 What role did Christianity play, both in contributing to the Salem witch hunts and in bringing the terror to an end? Summarise each of these verses in your own words. How might these verses speak into events such as the Salem witch hunts? How does Jesus say we should treat our neighbour? Why do you think Jesus calls these two commandments the most important? Create a series of images for an Instagram story that might be used in a campaign against modern online “witch hunts”. Read this opinion piece in the New York Times, “The Persecution of Witches: 21st-Century Style”. Imagine you have the opportunity to interview one of the following people mentioned in the article. Choose who you would interview and write five questions you would ask them. In small groups, discuss the following questions: To what extent is religion, including Christianity, responsible for modern witch hunts? How might Christianity be part of the solution to religiously based violence? Write a fictional short story about a modern “witch hunt” (maximum one page). Read Act 1 Scene 1 of The Crucible, Arthur Miller’s 1953 classic play about the Salem Witch Trials. Write a one-page essay about how religion influences the attitudes and actions of the characters in the scene. Contributors: Renee Gowing, Anna Grummitt, Simon Smart, Natasha Moore.